When RockTape is applied to the skin, it has a microscopic lifting effect underneath the skin and between the many layers. More specifically, it runs interference on pain. Ever whack your shin and rub it, and suddenly realize you feel better? 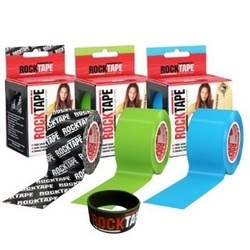 RockTape on the skin can interfere with painful signals which are directed to the brain. When the signals arriving to the brain are altered, it does not produce the sensation of pain. When kinesiology tape is properly applied, many of our customers call it “magic” or think that it fixed their injury instantly. In fact, it helps to change how your body interprets pain, turning down the pain “volume” that your body hears. RockTape does so by affecting the nerve endings and different types of receptors in the skin of the injured area. When RockTape is applied to the skin, it has a microscopic lifting effect underneath the skin and between the many layers. This allows for greater blood flow to and from an area, all while allowing the by-products created by inflammation to be removed more quickly.